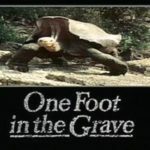 One Foot in the Grave is a British sitcom written by David . There were six series and seven Christmas specials over a period of eleven years from early 1990 to late 2000. The first five series were broadcast between January 1990 and January 1995. For the next five years, the show appeared only as Christmas specials, followed by one final series in 2000. 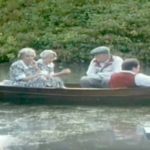 Hearts of Darkness – The Meldrews, Mrs Warboys and Mr Swainey take a trip to the countryside and find themselves where they end up stranded in a river playing Trivial Pursuit. Victor and Mrs. Warboys later end up with their feet in a concrete block. While searching for help, Victor stumbles across an old-people’s home where the residents are being abused by the staff, and hatches a plan to liberate them. 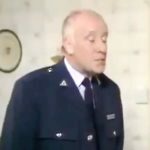 Alive and Buried – After 26 years in his job as a security guard, Victor Meldrew is replaced by an electronic box and a recorded message. Contemplating his future at home, sixty-year-old Victor gets a visit from Nick Swainey from the Outward Bound Scheme for the elderly. Victor also has a job interview.